The challenges of today will be solved by the designers of tomorrow. That’s why Autodesk gives students, educators, and educational institutions free* access to professional design software, creativity apps, and real-world projects. Autodesk Education helps inspire and prepare the next generation to imagine, design, and create a better world. CAD design, drafting, modeling, drawing, and engineering software. BIM tools for architectural design, MEP, and structural engineering. Innovative tools for 3D modeling, animation, effects, and rendering. 3D mechanical CAD, visualization, and documentation software. We love stories. We love technology. So we put ATAP engineers together with award-winning directors and together made a new storytelling canvas specifically for mobile. This is the end of flat mobile content. The Spotlight Stories Player uses the latest advances in 3D graphics to deliver immersive and interactive short stories in real-time. Unlike a conventional film, we’ve given you control of the camera so you can explore. Every viewing is different. Look around – sometimes there are surprises where you least expect them. It’s fluid and natural because we adapted the controls from those used for precision planetary landings. Spotlight Player will deliver these Stories in ways that are as novel as the Stories themselves. So, watch for something a little out of the ordinary coming to your home screen! Windy Day, our debut Spotlight Story, was created by Jan Pinkava, Oscar-winning director and creator of Pixar films, Geri’s Game and Ratatouille. Our latest Story, Duet, continues our exploration of this new creative canvas, with hand-drawn animation and a personal story for Disney Animation Legend Glen Keane. The Spotlight Stories Player requires a WiFi connection. 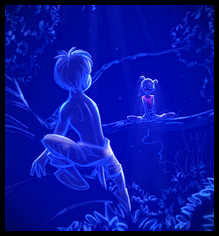 Animated and directed by Glen Keane, former Disney animator and creator of such beloved characters as Ariel, Aladdin, Tarzan and Rapunzel, our latest story Duet, tells the story of Mia and Tosh and their individual paths in life weaving together an inspired duet. The interactive story allows the viewer to seamlessly follow either characters from birth to adulthood. Hand-drawn frames in 3D, all around you, at 60 frames per second and flowing smoothly with symphonic music by Scot Stafford.